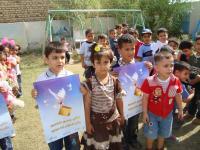 The La’Onf Iraqi nonviolence group of DhiQar visit the Mama Suna kindergarten. Many parents would prefer to avoid having difficult discussions about death and tragedy until their children are older and better equipped to manage their fears and anxieties. However, for Iraqi children growing up in the midst of military occupation, assassinations and road side bombs, the reality of violence and death is all around them. LaOnf organizers strive to create safe spaces for children where frank discussions about violence can take place, and alternatives to violence can be imagined. La’Onf Iraqi nonviolence groups engage young people as an important constituency and stakeholder in the community. Members describe youth and students as “the future of Iraq” (La’Onf organizer, Najaf) and capable of “building peace and changing the reality” (La’Onf organizer, Babil). One example of La’Onf efforts to apply nonviolent principles in practical ways in the interests of children is the campaign against war toys. In too many instances soldiers shot and killed children who were carrying toy guns that looked like real guns. The campaign began with programs in which children could trade in their toy guns for soccer balls. It then expanded into lobbying efforts. La’Onf’s campaign has now resulted in legislation banning the sale of war toys in the province of Muthanna. La’Onf activists hope to see national legislation passed in the near future. During the third annual Week of Nonviolence, La’Onf members have planned activities for young people of all ages, from kindergarteners to university students. They provide fun opportunities for children such as athletic events and releasing of doves, as well as venues for creative expression in art exhibitions and musical performances. And for older students they have facilitated workshops and discussions on the theory and practice of nonviolence in the Iraqi context. Young people are responding with great curiosity and involvement. La’Onf visited Mama Suna Kindergarten (pictured above) to talk about how to choose “nice toys and games” and how to solve problems without fighting. They discouraged the children from playing with toy weapons and gave them gifts of alternative toys. La’Onf organizers made plans to return for a nonviolence workshop with the children in the future. Al-Mesalla Center and the Youth Cultural Center organized a workshop of 20 young men and women on the meaning of nonviolence and how to promote a culture of peace in Iraq. Also, Al-Taleaa Kurdistan Children and IKNN organized a public party with Kurdish dance and circus performers, ending in the release of balloons to express the hope for peace and nonviolence.